Some big news is that Internet advertising revenues have reached $4.2 billion in the third quarter of 2006, according to the Interactive Advertising Bureau (IAB) and PricewaterhouseCoopers LLP. 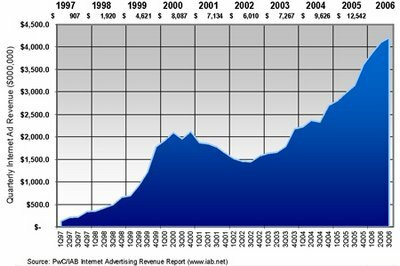 The graph below shows how ad revenues have been skyrocketing since the third quarter of 2002 after the dip from Q2 in 2000 when the bubble burst. It illustrates impressive growth coinciding with an upturn in the stock market, and really explains the phenomenal growth of Google's revenues. Google is taking the lion's share of Internet advertising with 3Q Adsense revenue of $1.04 billion.